If you are a bride and groom looking for a wedding venue, it’s important to find a venue to fit your style. 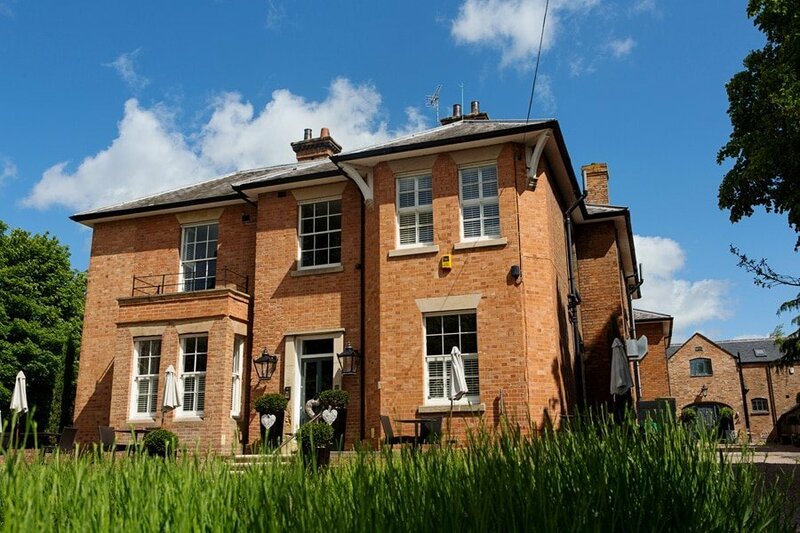 Weddings at The Old Vicarage Boutique Hotel are perfect for couples who are looking for an unique and intimate day. The styling throughout is luxurious, chic and contemporary. The bedrooms are all beautifully styled too and, from a photographer’s perspective, the venue as a whole is great to photograph at. If you have already chosen to have your wedding at the Old Vicarage, then my photos below will give you a glimpse of how I have photographed weddings there. As I photograph weddings primarily in a documentary style, most of my photos are not posed and capture guests naturally and candid with an aim that ultimately your wedding photos will tell a story of your day. I will, however, show you some formal portraits later on and where I photograph these. Let’s start with the most important part of the day. You have two choices of where to say “I do” at the Old Vicarage. The first being inside the chic venue and the second, during the summer months, outside in the Bandstand. I believe Charlotte and James’ wedding was the first wedding to take place in The Bandstand which I photographed in July 2016. The sun was shining all day and it felt much like a destination wedding. If your ceremony takes place inside the Old Vicarage, the decor is chic and glamorous with sparkling chandeliers and is perfect for intimate days. The time for you to relax and mingle with your wedding guests. The gardens are spacious but not so big that you lose half of your wedding guests (after all you’ve invited them to your special day, you want to see them!). As you can see from the photos above, the atmosphere is very relaxed. Summer weddings are also ideal for garden games at weddings and there’s not many guests who can resist a game or two. Or you can, of course, make your own games up like the guests here. There’s plenty of space to have a run around! The interior of the Old Vicarage is stunning. The colour palette of the bridal suite always works from my point of view. There’s plenty of light and mirrors which are great to capture reflections in. Depending on the number of people at your wedding having their hair and make-up done, sometimes one of the other bedrooms is used and again this is a great room to photograph in. On one weddings below, the bride’s make-up was done in the bridal suite’s bathroom which was another tick as far as me photographing in there was concerned. After the “I do’s”, canapés and drinks reception, it’s into the beautifully set dining room with candelabra’s decorating the tables. The staff are meticulous each step of the way with their decor and you won’t be disappointed with it. If you are having a winter wedding (or indeed the weather takes you inside! ), the interior provides a stylish setting for you and your guests to relax and mingle. Where to photograph your bride and groom’s portraits? Whilst I primarily take photos with a documentary approach, I do take some bride and groom portraits so I would like to show you some of the places I take these at the Old Vicarage. My style of bride and groom portraits keeps in line with my overall approach to wedding photography which is relaxed so nothing too forced or uncomfortable. There are some lovely places at the Old Vicarage to provide a backdrop for your bride and groom portraits. I can create some beautiful portraits here in a short amount of time so that you don’t miss any of your wedding day walking around large grounds. This was another bride and groom at the Old Vicarage whose wedding took place at the end of March. Although the greenery wasn’t as grown, there the gardens were still lovely for bride and groom portraits. I would say that most people who book me for their wedding photographer, do so because they want natural photos and don’t want to spend a long time lining up family and friends for formal photos. Most do, however, require a few group photos. I generally take these in the gardens (the location will be dependant on the light at the time) or at the front of the venue using the steps for a platform for larger group photos. Here a few photos to give you an idea. When the evening part of your wedding starts at the Old Vicarage, everyone gathers inside to make way for the bride and groom to start the dancing off … and always with the hope that their wedding guests join them on the dance floor. Although I’m usually booked to photograph the day until the first dance, I aways stick around for some photos of the guests dancing too so encourage brides and grooms to make sure their guests join them on the dance floor! Finally, so much time to goes into the finer details of weddings, not only by the bride and groom but by the venue itself. The Old Vicarage are experts in this field and will ensure all of your requirements are exceeded in every way. If you have a wedding booked at the Old Vicarage or are planning to look round, I hope my photos will give you an idea of the type of photos that can be captured (in my style of course!). This page is just to show you some of my photos of weddings at the Old Vicarage Boutique Hotel. If you have any questions about the venue, please get in touch with Suzanne or Chelsea direct.